For White Gauge T10 LED bulbs This T10 LED will replace socket bulbs number :194 ,W5W 147 152 158 159 161 168 184 192 193 259 280 285 447 464 501 555 558 585 655 656 657 1250 1251 1252 2450 2652 2921 2825 PC 175 2886X. W5W W3W 147 152 158 159 161 168 184 192 193 194 259 280 285 447 464 501 555 558 585 655 656 657 1250 1251 1252 2450 2652 2921 2825 PC 175 2886X. 20pcs T10 wiring harness sockets, not including led bulbs. Bulb Base: Ba9s Bayonet. 20pcs Red Ba9s LED Light Bulbs. 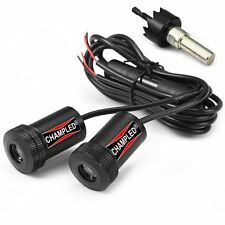 Volts: 12V. LED Type: 1-5050-SMD LED. Color: Red. If it doesn't light up, just flip it 180 degrees then it should light up. Glove box light. Map reading light. Type: Wedge Base Sockets. Sockets Fit for the bulbs of Part#194 =W5W 147 152 158 159 161 168 184 192 193 259 280 285 447 464 501 555 558 585 655 656 657 1250 1251 1252 2450 2652 2921 2825 PC 175 2886X. If the LED does not light up, simply Rotating it 180 degrees (reverse the polarity). Appreciate your understanding! Note before ordering. This T10 LED will replace socket bulbs number :194 ,W5W 147 152 158 159 161 168 184 192 193 259 280 285 447 464 501 555 558 585 655 656 657 1250 1251 1252 2450 2652 2921 2825 PC 175 2886X. Ultra Bright LED, unique and more vivid color. T10 wedeg bulb = W5W 194 147 152 158 159 161 168 184 192 193 259 280 285 447 464 555 558 585 655 656 657. Bulb Type: T10 Wedge. 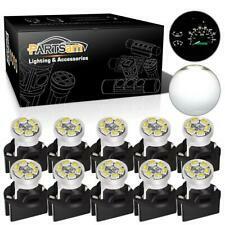 10pcs White T10 LED Bulbs. 10pcs Red T10 LED Bulbs. 10pcs Green T10 LED Bulbs. New sockets for automotive #194 wedge bulb. 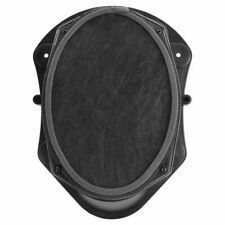 Do not confuse these sockets with the T5 74 wedge socket which fits a 3/8" hole or the T10 194 wedge socket which fits a 1/2" hole. Bulb pushes into this socket. 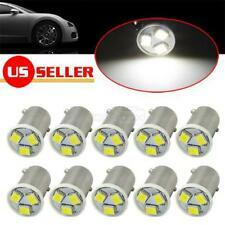 10pcs Ba9s 2835 SMD Led bulbs. Cross Reference: 1815, 1816, 182, 1889, 1891, 1892, 1893, 1895, 1895A, 1445, 17053, 53, 53X, 57, 216, 293, 363, 3886X, 3893, 6253, 64111, 64113, 64115, 756. What is 2835 SMD?. 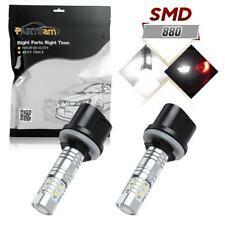 Replace socket bulbs number: BA9S 57 1815/1895. 10x Ba9s 5050 SMD Led bulbs. Indicator etc. LED Type: 5050 SMD LED. Ultra Bright LED, unique and more vivid color. Color: Red. Dashboard warning light. Decorative light. T5 = 17, 18, 27, 37, 57, 58, 70, 73, 74, 79, 85, 2721, 1895, 182, 257, W1.2W. 10x T5 1-5050 SMD White LED. 10x T5 1-5050 SMD Red LED. 10x T5 1-5050 SMD Green LED. 10x T5 1-5050 SMD Ice Blue LED. 20x T5 1-5050 SMD Blue LED. 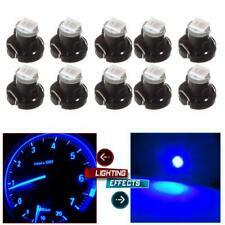 10 pieces Blue T10 /194 Wedge Bulbs. T10 = W5W 147 152 158 159 161 168 184 192 193 259 280 285 447 464 501 555 558 585 655 656 657 1250 1251 1252 2450 2652 2921 2825 PC 175 2886X. Base Type: T10/194 Wedge. T10 = 194 147 152 158 159 161 168 184 192 193 259 280 285 447 464 555 558 585 655 656 657 1250 1251 1252 2450 2652 2921 2825 12256 12961 2521 2525 W5W. Base Type: T10 Wedge. 20pcs Green T10 LED Bulbs. It will be much brighter than your original halogen bulbs, and the working life span will be much longer. 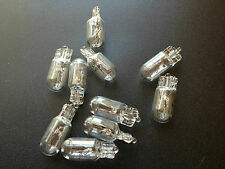 20 pieces Red T10/194 Wedge Bulbs. LED Type: 6-3528-SMD. Color: Red. 10x White Ba9s 5050 SMD LED bulbs. 10x Blue Ba9s 5050 SMD LED bulbs. 10x Red Ba9s 5050 SMD LED bulbs. 10x Green Ba9s 5050 SMD LED bulbs. Cross Reference: 1815, 1816, 182, 1889, 1891, 1892, 1893, 1895, 1895A, 1445, 17053, 53, 53X, 57, 216, 293, 363, 3886X, 3893, 6253, 64111, 64113, 64115, 756. 20pcs Twist Lock Sockets. Color: Blue. 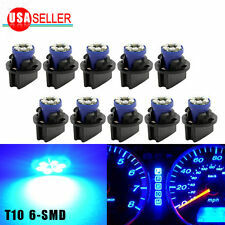 20pcs Blue T10 LED Bulbs. Note before ordering. Don't use for PC161 PC194 plug in Sockets. PC191 ,194 Bulbs use 1/2" Socket ,not 5/8" Sockets. Sockets Fit for the bulbs of Part#194 =W5W 147 152 158 159 161 168 184 192 193 259 280 285 447 464 501 555 558 585 655 656 657 1250 1251 1252 2450 2652 2921 2825 PC 175 2886X. Connector Type:T4W, 53, 57, 182, 257, 363, 1445, 1895, 6253, 64111, 39431, H6W, 3886X, 233, Q65B, BA9, BA9s housings. 6 x Ba9s 3-2835-SMD Blue LED. LED Type: 3-2835 SMD LED. High quality and super bright LED bulbs. T5 = 17, 18, 27, 37, 57, 58, 70, 73, 74, 79, 85, 2721, 1895, 182, 257, W1.2W. 5x T5 Cob High Power SMD White Bulb. 15x T5 1-5050 SMD Blue Bulb. 15x T5 1-5050 SMD Red Bulb. 15x T5 1-5050 SMD Green Bulb. Bulb Base: Ba9s Bayonet. 4pcs Green Ba9s LED Light Bulbs. Cross Reference: 1815, 1816, 182, 1889, 1891, 1892, 1893, 1895, 1895A, 1445, 17053, 53, 53X, 57, 216, 293, 363, 3886X, 3893, 6253, 64111, 64113, 64115, 756. 20 x Ba9s White 5050 SMD LED bulbs. LED Type: 5050 SMD LED. Cross Reference: 1815, 1816, 182, 1889, 1891, 1892, 1893, 1895, 1895A, 1445, 17053, 53, 53X, 57, 216, 293, 363, 3886X, 3893, 6253, 64111, 64113, 64115, 756. T10 bulb will replace part Number: T10 W5W W3W 147 152 158 159 161 168 184 192 193 194 259 280 285 447 464 501 555 558 585 655 656 657 1250 1251 1252 2450 2652 2921 2825 PC 175 2886X. Upgraded NON-Polarity White T10 LED Light Bulb. 10xIce Blue T10 4-3528-SMD LED. Light color: white. Type:Wedge Base Sockets. Sockets Fit for the bulbs of Part#194 =W5W 147 152 158 159 161 168 184 192 193 259 280 285 447 464 501 555 558 585 655 656 657 1250 1251 1252 2450 2652 2921 2825 PC 175 2886X. It will generate much more vivid color than your OEM bulbs. Bulb Base: Ba9s Bayonet. 50pcs Red Ba9s LED Light Bulbs. 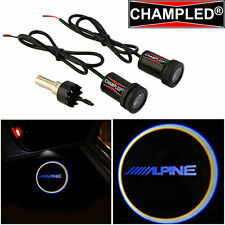 LED Type: Diode LED. Color: Red. Glove box light. Map reading light. Corner light. T10 = 168 194 147 152 158 159 161 175 184 192 193 259 280 285 447 464 555 558 585 655 656 657 1250 1251 1252 2450 2652 2921 2825 W5W PC175. 10pcs T10 Led Bulbs. Note: If the LED does not light up, simply rotate it 180 degrees (reverse the polarity). This T10 LED will replace socket bulbs number :158, 161, 168, 194, 28, 3652, W5W, 2886X, 921, 912. 10x Twist Lock Sockets. 10x T10 168 194 led bulbs. If the LED does not light up, simply Rotating it 180 degrees (reverse the polarity). T10 = W5W 147 152 158 159 161 168 184 192 193 259 280 285 447 464 501 555 558 585 655 656 657 1250 1251 1252 2450 2652 2921 2825 PC 175 2886X. It will be much brighter than your original halogen bulbs, and the working life span will be much longer. 10xT10 Extension Connector Wire Harness. Base Type: T10 194 (WedgeW2.1x9.5d ). LED Type:6-3020-SMD LED. Color : 6000K White. Note before ordering. Easy installation, 100% plug and play, if not light up, pls flip 180 degrees. Appreciate your understanding! 8x Non Polarity Red T10 LED bulbs. T10 W5W 158 168 147 152 158 159 161168 184 192 193194 501 901 904 912 916 917 918 920921 922 923 926 927. New SMD technology. Easy installation, Non Polarity, plug and play. Be compatible with 194,T10, W5W 147 152 158 159 161 168 184 192 193 259 280 285 447 464 555 558 585 655 656 657 1250 1251 1252 2450 2652 2921 2825. 5xBlue T10 6-3528-SMD LED. 5xGreen T10 6-3528-SMD LED. Trending at $60.42eBay determines this price through a machine learned model of the product's sale prices within the last 90 days. 10xT10 Extension Connector Wire Harness. Base Type: T10 194 (WedgeW2.1x9.5d ). LED Type:6-3020-SMD LED. Color : Blue. Note before ordering. 5 pairs T10 Led Bulbs. If the LED does not light up, simply Rotating it 180 degrees (reverse the polarity). Ultra Bright LED, unique and more vivid color. Note before ordering. Connector Type: T10 W5W 158 168 147 152 158 159 161 168 184 192 193 194 501 901 904 912 916 917 918 920 921 922 923 926 927. 10xIce Blue T10 4-3528-SMD LED. Color: Ice Blue. LED Type: 4-3528 SMD LED. High quality and super bright LED bulbs. This T10 LED will replace socket bulbs number : T10 W5W 158 168 147 152 158 159 161 168 184 192 193 194 501 901 904 912 916 917 918 920 921 922 923 926 927. Super Bright Vivid Ice Blue looking. White ,Blue ,Green ,Pink, andRed bulbs ! 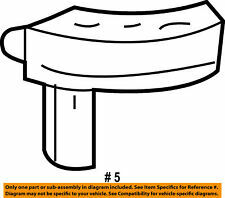 Replace socket bulbs number : BA9S 57 1815/1895. 10 x Ba9s 5050 SMD Led bul bs. LED Type:5050 SMD LED. Ultra Bright LED, unique and more vivid color. Dashboard warning light. Decorative light. Remark light.